The Department of Census and Statistics (DCS) in a survey conducted reveals that in the first half of 2018, at least one computer is available in 22.9% of households in the country. That is more than one out of every five households owns either a desktop or a laptop computer. This percentage is 39.5% in Urban Sector. The Rural and Estate Sectors show 20.3% and 4.9% respectively. 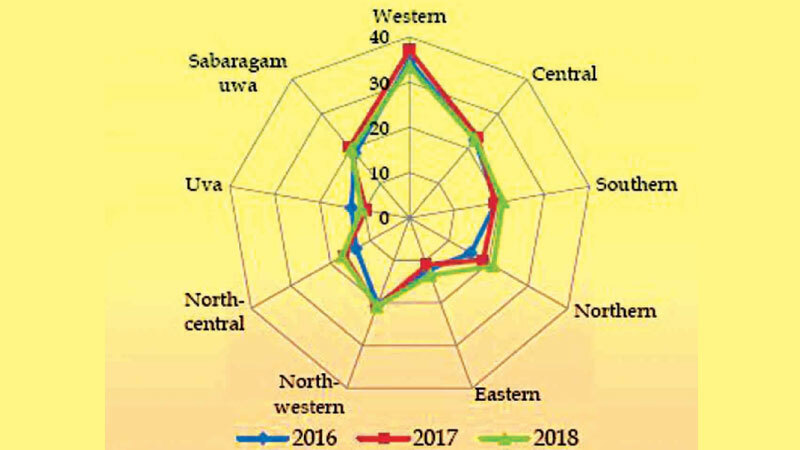 The highest availability is in the Western province (33.4%) while the lowest availability is reported from the Uva province (10.7%). Overall Computer Literacy reported in first half of 2018 for Sri Lanka is 27.5%. The survey results show a decrease of 0.8 percentage points from 2017 (1st half) to 2018 (1st half). The Urban sector shows the highest computer literacy rate (38.4%) among residential sectors. Computer literacy rate for Rural and Estate sectors are 25.9% and 11.1% respectively. Among the provinces the highest level of computer literacy is reported from the Western province (36.1%) while the lowest percentage is reported from the Eastern province. The computer literacy rate among districts show variations ranging from 8.6% (Kilinochchi) to 42.6% (Colombo) and shows the still prevailing digital divide (Table 2.1). Overall Computer Literacy reported in 1st half of 2018 for Sri Lanka is 27.5%. The survey results show a decrease of 0.8 percentage points from 2017 (1st half) to 2018 (1st half). Computer literacy among the employed population who are aware of computer in Sri Lanka is around 61.7% in first half of 2018 and the positions such as managers, senior officials and legislators (67.6%), professionals (85.8%), technical and associate professionals (83.3%) and clerks and clerical support workers (89.4%) have higher computer literacy rates.